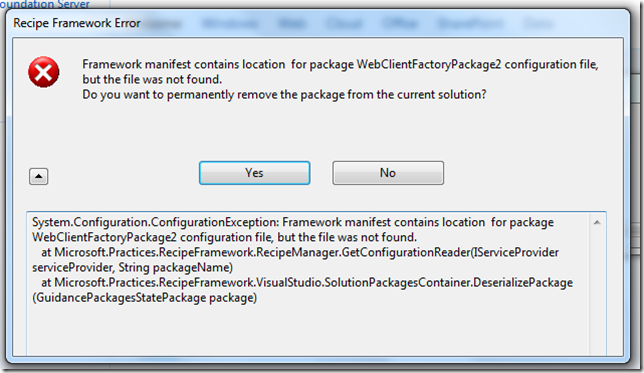 Framework manifest contains location for package WebClientFactoryPackage2 configuration file, but the file was not found. 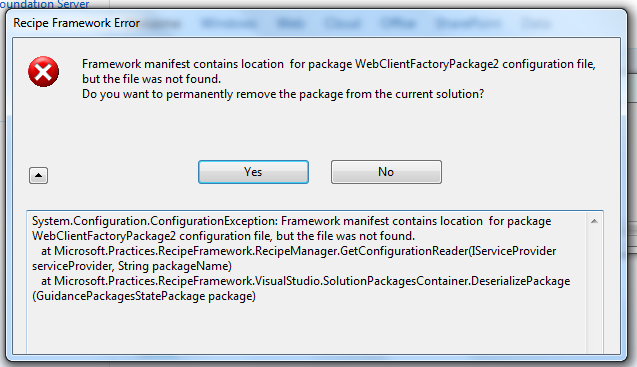 Do you want to permanently remove the package from the current solution? If you want to definitely convert to Visual Studio 2010, you may safely answer Yes. This error is caused by references in the solution.gpState file to the old version of the software factory. After removing you must reenable the WCSF in the Tools –> Guidance Package Manager –> Enable/Disable Packages in Visual Studio. Then references to the WCSF 2010 will be created (WebClientGuidancePackage2010).